Whew...well...Doug Zell, Amber Sather, Ellie Hudson, Jay, Rosetta twins (Schaads)Intelly crew in general. I hope you have forgiven my lapse in judgment. I value your friendship and fellowship. Here I sit at the Carriage house Cafe organizing my thoughts for the USBC....I'll be going into practice tonight and every night till I leave. Looking for some sort of carry-on that I can use to have my breakable gear by my side...I don't trust the air port or UPS...in this case Brown can't do anything for me. This last weekend not only did I compete in the Latte Art competition but I taught latte art classes. I had 5 classes total throughout the weekend six people in each class for a two hour time slot. A lot of work! I barely ever made it to the show floor...but it was a blast. I love to see people "get it". The more we understand our craft...the easier it is for us to give it. Most folks wether they had before or not, poured a Rosetta at the end of the class. Some were better than others but every time...when they finished and saw a leaf in their cup...they were floored. 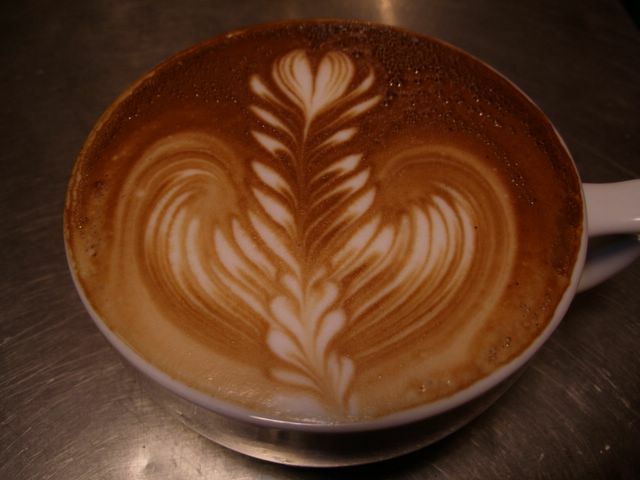 I'm glad that lots of people are interested in latte art. It shows that they want to add something "Extra" to their drinks. It is a good sign. The new girl at gimme!...Liz...got it fast...and she is pumped about espresso. I am seriously looking forward to doing some driving around the North East spreading the word about the BGA and organizing a Jam etc. Since I am the only one on the Ballot for the North East...I am starting to plan out the strategy now. I guess I need to get started practicing. I have much respect for those guys and for them to show up and be as involved as they were not only in the competition but during the ENTIRE event of Coffee Fest...the Party was killer and the folks I met were nothing but friendly. It really is a testament to how passionate they are about coffee and the coffee community. We need more groups like them who are willing to serve the Barista's and retailers etc. the way they have. So I do apologize with a bit of a red face...nobody likes a poor me attitude..nobody...including me. This is the superimposed rosetta with a heart at the top...could be called a tuplip I guess...done at gimme! and was sitting for a minute...hence the crema bubbles on the upper right.